The township of Toongabbie is about 20 km north-east of Traralgon, Gippsland and 176 km east of Melbourne. The area was part of the Rosedale pastoral run, taken up about 1844. 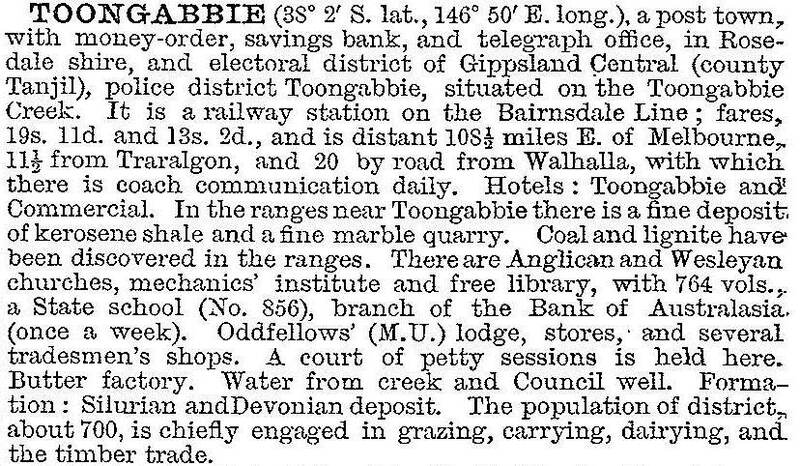 The name Toongabbie was in use by the mid-1850s, possibly bestowed because of a resemblance to the landscape at Toongabbie in New South Wales. In late 1862 gold was discovered in the Great Dividing Range to the north-west of Toongabbie. The goldfield, first known as Stringer’s Creek and then Walhalla, became one of the richest fields in Victoria. 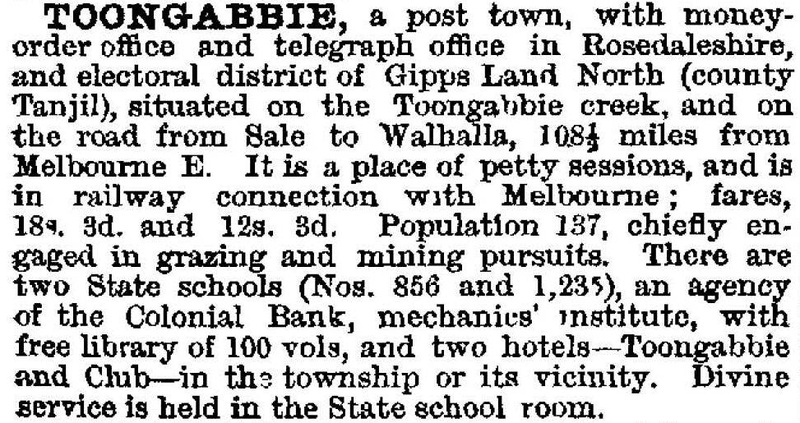 Miners entered Gippsland via Sale and journeyed to the gold rush by a track, which entered the mountains north of the Toongabbie district. However, a shorter route was soon found to the south. At the foot of the ranges, where all goods and passengers were transferred from wagons and drays to packhorses, a store and accommodation house were established. Consequently settlement at Toongabbie became an important staging post. Six to seven hundred horses and mules were engaged in the packhorse trade, transporting people, supplies and mining machinery over steep mountain tracks to Walhalla. Coach services soon operated to Toongabbie from Rosedale, and after 1878 from Traralgon connecting with the main Gippsland rail line. The track was widened and improved, accommodating wagons and eventually coaches right to Walhalla. Several sawmills worked during the 1880s and 1890s cutting the red gum forest for sleepers, paving blocks and building timber. As land was cleared, grazing and dairying spread. A cooperative butter factory operated from 1877 to 1909. In the 1870s black marble was discovered in the nearby ranges. Several tons was quarried and used for mantelpieces and ornamental building stone, but the deposit was never commercially utilised. Kerosine shale near Toongabbie was drilled but oil was not found. By the early 1900s mining at Walhalla had begun to decline. In 1910, a railway line was opened from Moe to Walhalla. This more direct route to Walhalla ended the traffic through Toongabbie. The town lost residents and services. The last hotel closed in 1929 and the police station was moved in 1930. Since then, it has functioned mainly as a social centre for the surrounding farming district. In the 1970s the population grew again, reaching 453 in 1986, as people employed in the nearby Latrobe Valley chose a quiet country lifestyle. Toongabbie has a general store, a primary school (59 pupils, 2014), an Anglican church and a recreation reserve adjoining the mechanics’ institute. The Toongabbie Mechanics’ Institute, almost derelict for many years underwent extensive restorations from 1991 and is listed on the Historic Buildings Register. Ned Stringer, one of the prospectors who discovered gold at Walhalla died in 1863 at Toongabbie. He was buried by the roadside and later reburied in Toongabbie Cemetery.